Project Quality Management: Why, What and How, Second Edition demonstrates how to implement the general methods defined in A Guide to the Project Management Body of KnowledgeFifth Edition (PMBOK Guide) and augments those methods with more detailed, hands-on procedures that have been proven through actual practice. This edition presents case examples that illuminate the theory of quality planning, assurance, and control with real-world narratives, including situation, analysis, and lessons learned. 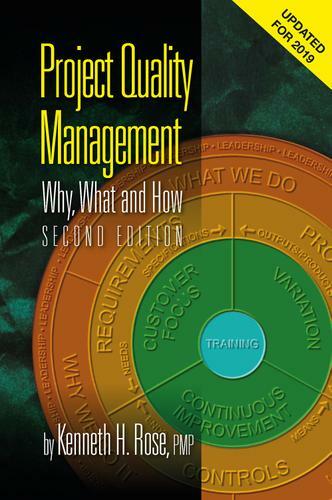 It also provides course discussion points and practical exercises at the end of each chapter.In its first edition,Project Quality Management, was the recipient of the 2006 PMI David I. Cleland Project Management Literature Award. The award-winner offered project managers a specific, succinct, step-by-step project quality management process found nowhere else. This second edition features updated and enhanced material that meets the needs of practitioners, trainers, college instructors, and their students! Course instructor material is also available.